Hummus is one of those delicious things in life that you can do so much with. Dip carrot sticks in it, put it on a burger, eat it with a spoon, or use it as the main ingredient in a sandwich. It adds such a creamy texture to a sandwich, with plenty of healthy fats. Add lots of veg and this is the Ultimate Hummus Sandwich. Posting a recipe for a sandwich kind of feels like posting a recipe for toast. It is pretty self explanatory – you make a sandwich by putting all the filling in between two pieces of bread. But, I think sometimes we can all get in a bit of a sandwich rut and run out of ideas of what to use as filling. When we have a pot of hummus that needs using up (that isn’t usually an issue), we make an epic hummus sandwich. Stacked up high and bursting with vegetables. It’s a real pick-me-up and nice and quick to make too. The great thing about hummus, apart from how good it tastes, is that there are so many different flavours out there. Keep it plain, or get adventurous. If you are short on time, use a good quality store bought hummus, or you could make your own. Have you tried our Roasted Red Pepper Hummus or Butternut Squash Hummus? Hummus is the ultimate vegan sandwich filling. I mean, who just wants a lettuce sandwich? You could make this even more filling by adding some falafel to it, and still keeping it vegan. Why is it the ultimate hummus sandwich? Look at it! It is overflowing with goodness and deliciousness. A sandwich doesn’t need cheese and mayo to be tasty, which is why we left it out of this one. Instead, we added as much salad and vegetables as we could and it made for some messy eating, but totally worth it. Maybe wear a bib when eating it though. We then took this sandwich to the next level by spreading a thin layer of chutney on the bread. We used a local Yorkshire chutney, but you could use any of your favourites. It adds some nice extra texture. Actually, what would make this sandwich even more of the ultimate hummus sandwich would be to add some avocado. Doesn’t avocado make everything better? But I had run out. Which almost NEVER happens. That just means that I have to make this again very soon. Maybe some sun-dried tomatoes too. So many options. One: Spread the hummus on to one slice of bread and the chutney on to the other. Pile all of the rest of the ingredients on to the hummus slice of bread and then top with the other slice and serve. Take this sandwich to the next level by adding a spoonful of your favourite chutney. Want to make this even more epic? Add some slices of avocado and sun-dried tomato. Try making your own hummus and making different flavours like roasted red pepper or roasted butternut squash. Feel free to add any shredded vegetables or salad that you have that needs using up. Do you want to be kept up to date on more delicious posts like this Ultimate Hummus Sandwich? Please subscribe to the blog mailing list (it takes 30 seconds). 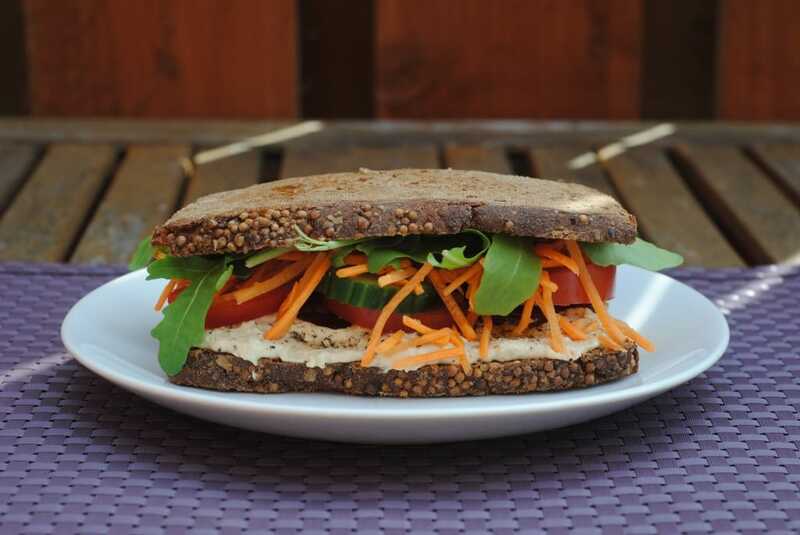 If you’ve tried this Ultimate Hummus Sandwich, or any other recipe on the blog, then let us know how you got on in the comments below, we love hearing from you! You can also FOLLOW US on FACEBOOK, TWITTER, INSTAGRAM and PINTEREST to see more delicious recipe ideas, behind the scenes shots and also what we are getting up to. 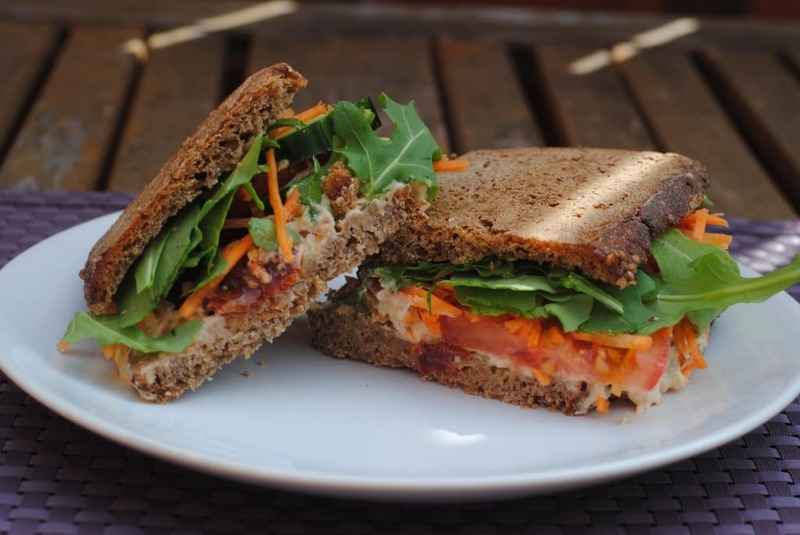 Hummus adds such a creamy texture to a sandwich, with plenty of healthy fats. Add lots of veg and this is the Ultimate Hummus Sandwich. Spread the hummus on to one slice of bread and the chutney on to the other. Pile all of the rest of the ingredients on to the hummus slice of bread and then top with the other slice and serve. This sandwich looks so good – I can see why it’s called the ‘ultimate’ hummus sandwich! I’m always using hummus as a dip, but haven’t really ever put it on a sandwich, so I’m going to have to try it now 🙂 YUM! This is totally my kind of sandwich! I love all the veggies, strawberries and hummus in here! Can’t wait to try this for lunch one day! I know so little about hummus, I usually just buy it from the store! Time to make my own. So interesting that you are putting fruit on sandwiches, now that is a new one for me!!! !